Melanie is an historian, speaker, and writer, who specialises in researching the history of houses, streets, and areas throughout the United Kingdom. For close to six years Melanie was the first and only historian to be employed by a UK estate agent to research the history of houses and streets. Since 2012 Melanie has been an independent house historian, completing private house history commissions, as well as consulting for corporate projects and property companies. Melanie has written two books: Historic Streets and Squares: The Secrets on Your Doorstep and House Histories: The Secrets Behind Your Front Door. 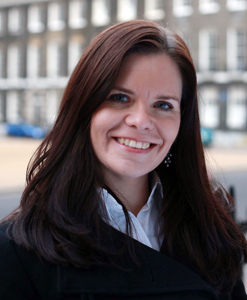 Melanie has written for The [London] Times and regularly contributes to the Homes & Property blog for The Evening Standard, while her house histories have appeared across the national media, including the Financial Times and The Telegraph. She is also a frequent contributor of articles and expert comments in the media, including BBC radio, and is also actively engaged in social media and tweets as @househistorian. Melanie is an honorary teaching fellow at the University of Dundee and tutors a house history module for The Centre for Archive and Information Studies. Melanie is also a regular speaker on the history of houses, including The Ideal Home Show, as well as at the Geffrye Museum in collaboration with School of Geography at Queen Mary, University of London, and in 2013 Melanie spoke at the first Institute of Historical Research conference, ‘Mobilising London’s Housing Histories’. Melanie talked about appearing on different tv shows such as Restoration Home and Restoration Man. The shows weren’t specifically house history shows but her expertise contributed to the story. She also talked about networking with heritage professionals to create opportunities. You can transfer the same thought process to your business as a genealogy professional. Are there organizations outside of genealogy but related to your niche that you could partner with? If you specialize in a geographic area then you would want to focus on Heritage and Historic organizations in that area. If you have an ethnic niche think about the different organizations associated with your group. Perhaps they could be music or cultural groups, history groups, language-based groups or something else. You can expand your reach and your business by partnering with other organizations and showing how you can be of value to them. This week brainstorm a list of organizations that you could possibly partner with and think about how you could provide value to them by sharing your expertise.